The reality of Project LIBERTY can be found around the Emmetsburg, Iowa area in the form of biomass bales… and the steel supports of the rising biorefinery. 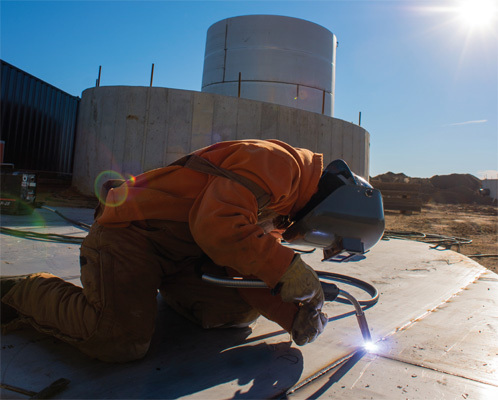 Located south of POET Biorefining – Emmetsburg, active construction and materials fill the future site of Project LIBERTY. For the past three-plus years, Project LIBERTY – the soon-to-be-completed commercial-scale cellulosic ethanol plant in Emmetsburg, Iowa – has made steady and impressive progress. The project has produced everything from first-of-its-kind technological advancements to important partnerships to real-world results from POET’s cellulosic pilot plant in Scotland, S.D. And plenty of excitement has surrounded the project. The project is owned by POET-DSM Advanced Biofuels – a joint venture that combines POET’s ethanol expertise with the global reach of Royal DSM, a leader in yeast and enzyme technology. At its peak, Project LIBERTY is expected to convert 270,000 or so tons of biomass – crop residue in the form of cobs, leaves, and husks – into 25 million gallons of ethanol annually. The plant is slated to open in late 2013, and POET-DSM plans to buy 120,000 tons of biomass and produce 20 million gallons of cellulosic ethanol in that first year growing to 25 million gallons annually. But, for the most part, LIBERTY’s headway has been visible only in progress reports and press releases. That’s all changing now, as the first signs of vertical construction – the above-ground foundations and steel supports – rise from the ground at the Project LIBERTY site. The plant itself is starting to take shape, literally, and that’s made the progress seem more tangible, even for some of LIBERTY’s long-time participants. Those bales represent the thousands of tons of biomass that POET-DSM has been buying from area farmers as part of the company’s three-year test run in preparation for the plant’s opening in 2013. This year, 85,000 tons of biomass were contracted. Once operational, Project LIBERTY will require 285,000 tons per year. Rick Hurley, an Emmetsburg-area corn and soybean farmer, is one of those suppliers who has been delivering biomass bales to Project LIBERTY since that first season. “It’s pretty exciting stuff to see this plant start to take shape,” Hurley says. “This has the potential to really benefit the area, because that money is going to be re-spent within the community. And that’s already happening. Earlier today I drove by an equipment dealer in Emmetsburg that wouldn’t be here if it wasn’t for that plant being built. That’s what brought him to the area. And for Hurley, Project LIBERTY has meant more than just an additional revenue stream – the studies from the biomass research could have long-term positives for his crop production. Hans van der Sluijs, the Co-Director for POET-DSM Advanced Biofuels with DSM, points to the recent realworld results, and to some the major decisions made over the last few months, that have moved Project LIBERTY forward. Still, he says, the excitement of those behind-thescenes advancements is no match for the tangible sights and sounds of Project LIBERTY’s first stages of construction.